Dear New: Certainly I will help you. To answer about textures and how I use them, I can give you an overview of what SketchUp can do with photo textures, and point you to resources that will teach you how to do it, too. 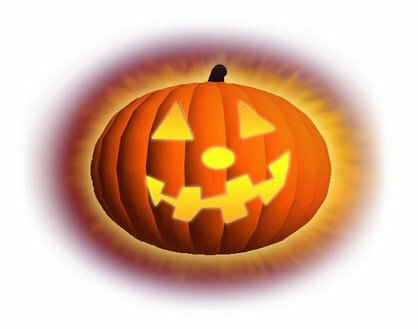 I only project a texture when necessary; otherwise I simply import the texture and stretch it over a face (using the pins found in the context menu)... then I choose "make unique texture" (also in the right click menu). This trims all the invisible parts of the photo, leaving only what is visible on the face, thereby reducing file size. For curved surfaces such as domes, I project textures (also found in the right click context menu). See my post about the Griffith Observatory model for an example of this. As creative people you will appreciate this video. 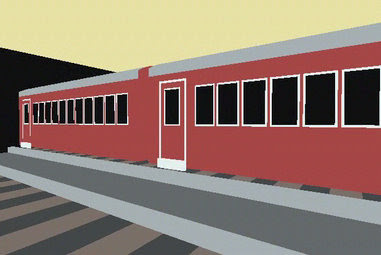 In SketchUp we re-create buildings, towns, and cities in digital paint. Performance and visual artist Kseniya Simonova creates these same things as moving pictures in sand. Kseniya Simonova is a Ukrainian artist who won the 2009 Ukrainian version of "America's Got Talent." Watch below as she interprets the German invasion and occupation of Ukraine. One of the most amazing things I have ever seen. Thanks to Redweather for pointing this out. Earlier I reported on the 2012 opening of Disney's re-imagined Fantasyland in Orlando, Florida. Disney's announcement coincides with Universal's opening (next year actually) of The Wizarding World of Harry Potter which will include a replica of the famous Hogwarts castle, Hogsmeade Village, and various HP-themed rides. The reason I mention it at all is because there is already a fully 3D version of Walt Disney World on Google Earth. I wonder if the models will be updated to reflect Disney's park expansion, and I wonder if Universal/Warner Brothers will be smart enough to create a fully 3D version of THEIR park to compete online as well? Harry Potter in 3D on Google Earth? Wouldn't that be cool. I wonder if that means a major do-over of the virtual 3D Disney World found on Google Earth? 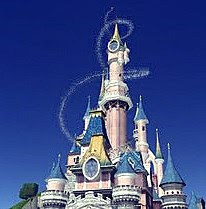 Changes to the park will include updated versions of old favorites, like the Dumbo ride, some new rides (including a "dark ride" based on "The Little Mermaid"-- click the illustration for enlargement), and a greatly expanded area with additional castles for other Disney princess characters (Cinderella's castle is the centerpiece of the Florida park). The reason for the expansion is to compete with the Harry Potter theme park to be opened in Universal Studios Orlando in 2010. Maybe that will be yet another 3D Google Earth project? Lately I've been watching Chef Gordon Ramsay on www.hulu.com... both his "Hell's Kitchen" show and also "Kitchen Nightmares." Gehry + 3Done = WOW! Check out this amazing model by Super Modeler 3Done. It depicts MIT's Stata Center by architect Frank Gehry. lots of organic forms and tricky textures. Great job! Today's "Hang In There, Baby" column focuses on the work of MILO Minderbinder, whose main area of interest is Art Deco architecture in Miami, Florida (USA). The purpose of this column is to give some encouragement (hang in there, baby!) -- particularly when you feel your first version of a model is not so great. Today MILO shares with us a model he made called "Colony Hotel" and a before and after illustration of the work he did on it. John Wilkes from Dursley, England, sent me a print article from the Dursley Gazette all about his trip to the Boulder, Colorado, Super Modeler Conference. The conference took place in Google's Boulder offices in August 2009. Click on the image to enlarge and see a paper print version of the article. I was climbing the south face of SketchUp Island mountain on a crisp, late-summer morning, looking for a stream to quench my thirst. The sun was warm on my back. I heard the distant sound of the clear, babbling brook. It grew louder as I climbed... But when I paused to catch my breath, sitting on a moss-covered Boulder, it grew louder yet. A helicopter?! A helicopter was approaching me from the south-- Saved at last!-- It hovered directly above my head; I waited for the rope ladder to drop. But the helicopter just hovered there and then turned around and went directly north! Check this out. 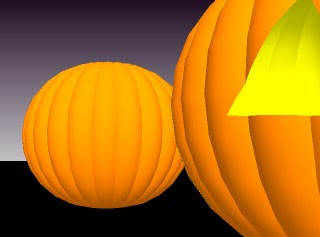 It's not easy to create believable organic forms and keep the file size small-- but SketchUp user "www.ektha.com" pulled it off in only 2 MB using some visual tricks and components (repeating elements that help reduce unnecessary duplicate geometry). The textures are applied skillfully too-- how did they do that?! When we last heard the words "3D building" and "Latin America" together it was because 3D structures were disappearing from Google Earth. This time it's better news: Blog viewer and SketchUp Islander NESUA informs me that several major cities in Latin America have been enhanced with a new gray buildings layer (buildings with geometry but no textures yet). Click the illustration to see the gray buildings layer in Rio de Janeiro, Brazil. Thanks, NESUA, for the heads up! SketchUp Islanders accustomed to seeing a built-up 3D virtual New York City on Google Earth may enjoy this look at another island. Manhattan Island, New York, was known as Mannahatta in its natural state prior to European arrival and settlement. Mannahatta/Manhattan: A Natural History of New York City uses historic artifacts, maps, and multimedia presentations to give viewers a sense of the development of Manhattan from its original state to what it is today. The show can be seen at the Museum of the City of New York for just a few more weeks, until October 12. SketchUp Islanders interested in history, photography, and architectural images might enjoy the Shorpy blog. 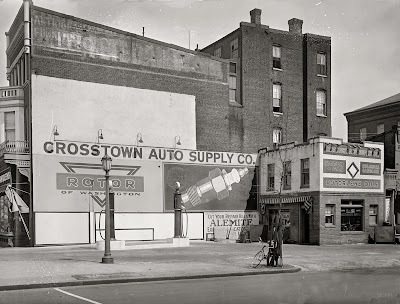 In the 1927 image above, notice details like the multiple layers of sign paint on the wall and goods in the shop window. Shorpy has thousands of high definition images like this. Maybe some could be used to recreate lost places in SketchUp! This looks sort of fun. I checked the website for the new Google Maps online game called Monopoly City Streets and it appears to be working after today's earlier crash (because of high demand). Also enter to win... create your own game piece in SketchUp and it may be featured as one of three new game pieces for Monopoly City Streets. Blog entry about that here. EDIT: If it doesn't work for you then keep trying. I got it once then another time I didn't. SketchUp / Monopoly City Streets Design Contest! As part of the launch of Monopoly City Streets massive multi player game, everyone and anyone is invited to use SketchUp to design 3 new, virtual Monopoly Game pieces. Newcomers to SketchUp and old pros alike are eligible to submit a design. You must be at least 13 years old. Don't know much about SketchUp or how to use it? See the links below. It's easier than you probably think it is. Read all about it at the official blog here. See current contest design submissions on the 3D Warehouse here. Today is a special day because toymaker Hasbro has announced the release of a new, massive multi-player version of its Monopoly board game. Google Maps is the game board! 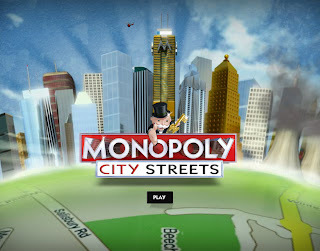 It is called Monopoly City Streets and will be available for play for four months, beginning today. Instead of traditional properties like Park Place and Pennsylvania Railroad, using Google Maps players will "acquire" real life streets anywhere in the world, and compete against other online players. See the blog, called Monopoly City Streets, here. Read a BBC News article about it here. Thanks to blog viewer Auquicu in Peru for pointing out this story! UPDATE: Apparently response has been so good, that the servers crashed! They are in the process of fixing it. Once fixed you can sign up at the website which is www.monopolycitystreets.com. In the meantime check out my other post involving a SketchUp design contest related to the new Monopoly game. And now for the final look at Nick Oberg's three-part "before and after" model series (unless Nick wants to share more), where Nick shows us the evolution of some of his best models on Google Earth. Nick (aka SittingDuck) is one of the best geo-modelers for Google Earth in my opinion. He, along with fellow SketchUp artist Chris (KR=), photographs his SketchUp building textures in such a way that captures a consistent lighting pattern representing a single moment in time. Most SketchUp users have a more eclectic approach, photographing building facades at varying times of day, in different kinds of weather, the result being good models that nevertheless lack the kind of sunshine "punch" offered up in some of Nick's work. One approach isn't necessarily better than another; but it is easy to appreciate the realistic results seen here in Nick's example. In the image below you can see how Nick began with a more varied set of photo textures, then unified them over time. The final result has the look and feel of a real building the way you would see it in real life. You can use the search bar in the side column to see Parts 1 and 2 of Nick's behind the scenes look at his work. Or, click the tag below called "Keep Trying"! Thanks Nick for sharing. Look for a future "Hang In There" column featuring the work of MILO Minderbinder. Labels: Buildings, How To, Keep Trying, Textures, Why Model? Just a very quick post inviting anyone who hasn't tried SketchUp to try it out, or "try it again for the first time." Alternately you can pass this along to anyone you've been encouraging to try out SketchUp. It's fast to learn and pretty fun once you've got the hang of it. Correcting height of the model using information from internet. Fixed lighting by taking photos on sunny days at correct time. Used Google Earth imagery for roof textures. Added finer and more accurate detail. Took more photos of model to make sure no face was missed out. Moved model onto model footprint. Notice in this model how geometric proportions have been re-examined and adjusted? Also textures have been cleaned up and unified. Higher contrast creates more visual interest and a believable "light source" in the details as well. Thanks again, Nick. Get out your scopes and scan the horizon for the next boat. And if none are coming, at least we'll have part three of "Hang In There, Baby" with Nick Oberg to look forward to. A friend posted this on Facebook and it caught my eye. 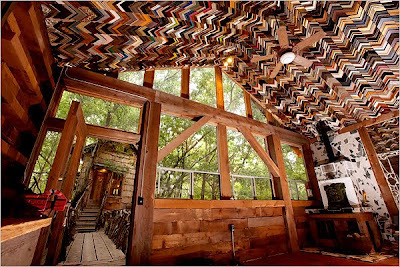 These are beautiful (really beautiful and unusual) houses a man named Dan Phillips makes in Huntsville, Texas out of all sorts of junk and recycled materials. Have a look at the article and slide show at these links: One Man's Trash (New York Times article by Kate Murphy, September 2, 2009) and a slide show. MILO Minderbinder has sent me a beautiful photo-textured model of a town hall for inclusion in my 3D Warehouse collections. Check it out below! Psst! Hey! What's A LiDAR? "Once back on the ground, these clouds are looked at, and combined using software into what is called a DEM (Digital Elevation Map). From there, you can get several different kinds of DEMS. Since there is so much that the light rays can bounce off of, they are able to pick up things from tree heights, building heights, and sometimes even dense clouds. Therefore, it is possible to end up with three different DEMs for an area. One that is a tree-line elevation, one that is a building elevation map, and one that is strictly a terrain map. Those different anomolies are all taken out by software gurus way smarter than me! Just think of someone dumping a bunch of points or tiny lines in SU, and then trying to determine what they mean! Doesn't sound fun to me! "Once your DEM's are created, that's where the SU fun begins! From those DEMS, we can make contours which we can then model, and submit to Google Earth. Unless the individual user has some pretty pricey equipment, the average SU user won't have access to a raw DEM, even though that would be the format that Google would like most. That's where the cities and municipalities come in. Most cities have a Geographic Information Systems (GIS) department these days. They would be able to submit that raw data for Google to use in large scale terrain maps! I'm currently working with the University and the surrounding area on getting more of our recent DEMs to Google. Hopefully to them within the next month or so. It usually takes Google a bit longer to upload that data to GE, than the standard one week in the pipeline!" NOTE: In some cases apparently the LiDAR scan used in a municipality seems to be a low-resolution building elevations scan. In some cities this appears like gentle lumps scattered across areas that should be flat. Is that correct? Maybe a viewer knows. The great SketchUp Island volcano has blown its top and now the lava flow is cooling down and solidifying in the ocean. As a result the Island is growing larger. 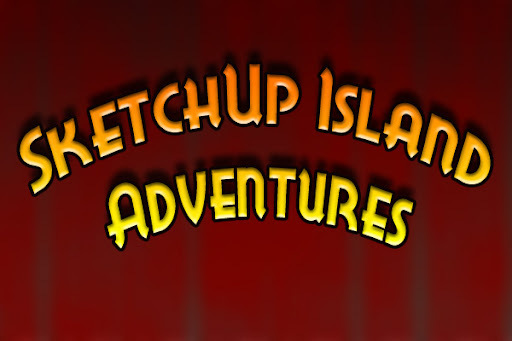 In the first week of SketchUp Island's existence there was an influx of visitors. Now we are at a steadier, more "loyal" pace, with still new visitors and castaways marooning on the Island but with return marooners coming more frequently and spending more time. (Apparently they escaped, not knowing that the evening tides pull them back, anyway). "The Evolution of a Model"
An early model was my local church in Dursley. I made the model first in an untextured version; then coloured it with 'paintbucket' textures. 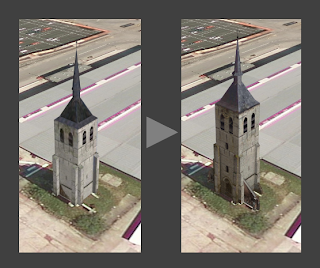 As more of my, fully photo-textured, models were accepted by Google, the church model looked out of place and in fact was removed from Google Earth. I then spent a day taking more photos and applying them to the church model. I think each of the three versions has a merit of its own. Thank you, John Wilkes. If you would like to see more blog posts about John, please try the search feature located in the side column. Labels: Buildings, Google Earth, How To, Keep Trying, Textures, Why Model? Thanks, Nick. Viewers stay tuned for more "before and after" looks at Nick's models in the future. Labels: Buildings, How To, Keep Trying, Photography, Textures, Why Model? Blog viewer and fellow "Super Modeler" SittingDuck has sent in his response to the post where I displayed my first ever SketchUp model. In the illustration we can see the time and care that SittingDuck has put into this very first model of his. Being someone with very little patience I often finish off a model as quickly as possible, and as a result it always has one or two flaws left unaddressed. This leads me to making 2-3 iterations of any given model. I don't do that as much these days, but I sure did way back when. Observe the evolution of my first model in the first attached image. Unfortunately I don't have the very first version anymore, which, like your florist's shop, had no textures. I have many more of these before/after cases if you are interested to see them, just say. Good work on the blog, it has already become my favorite (no joke) to follow. Thanks, SittingDuck! And yours are some of my very favorite SketchUp models. I'd love to see more of your before/after renderings and I'm sure others would too. Wouldn't they??? Labels: Buildings, Textures, Why Model? Several Peruvian building models have disappeared from Google Earth in Lima, Peru! What could be the reason? Some speculate that alien abduction is to blame. Actually, a Googler informed me that the reason for the buildings' disappearance is due to lack of photo texturing. Please see this link for more details on this. (The real reason is aliens, we all know, but this makes a good alibi for the general public). Are your building models disappearing? Do you need inspiration to go on? Look at this link and this one too. (Many currently accepted Google Earth buildings began as un-textured 'paint bucket' models, but went on to live long, happy, and successful lives as photo textured models).